Indianapolis - After a six-year wait, Michael Andretti is returning to greatest spectacle of racing. The 38-year-old Andretti, who is campaigning the 2001 CART series in a Motorola- sponsored Team Green Reynard/Honda, will officially announce Tuesday that he will race this year's Indianapolis 500. Motorola and Archipelago are rumored to be sponsors on the car. It was well known in racing circles that Andretti longed to return to the world's most famous racetrack, where he has yet to win in 11 attempts despite leading 382 laps. 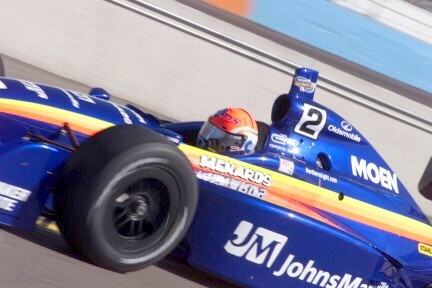 Andretti, the son of racing legend Mario, became CART's all-time leader in victories (40) and laps led (6,409) and the 2000 season and is the active leader in pole positions (32), trailing only Rick Mears by seven in CART history. Other than one season with Target Racing and a brief stint in Formula 1, Andretti's accomplishments have come primarily with Newman/Haas Racing. But when the Indy Racing League broke away from CART in 1996 and took the Indianapolis 500 with it, Newman/Haas elected to boycott the famous race like many other teams. At this year's CART season preview, shortly after joining Team Green, Andretti said he would do everything in his power to return to Indianapolis, and now it looks like that will finally happen. While no one at Team Green would officially confirm what has long been rumored, the Indy Racing League announced Thursday that a press conference would take place at the Indianapolis Motor Speedway's infield media center. "Tony George, Michael Andretti and Barry Green will make a special announcement regarding the 85th Indianapolis 500, scheduled for May 27," the press release stated. An employee at Team Green's headquarters in Indianapolis, who spoke on the condition of anonymity, said the team would have a fully prepared and painted IRL car at the conference bearing Motorola sponsorship. Andretti, the 1991 CART Champion, will try to become the second straight CART driver to win the coveted Indy 500 title. In 2000, Target Chip Ganassi Racing driver Juan Montoya became the first rookie to win at the Brickyard since Graham Hill in 1966 - and he did it with very little test time in an Indy Racing League car. Andretti will be the fifth CART driver to throw his name into the pool of those competing for 33 starting positions, in addition to Team Penske drivers Gil de Ferran and Helio Castroneves and Ganassi drivers Bruno Junqueira and Nicolas Minassian. In preparation for the 500, Team Penske competed in last week's IRL race at Phoenix, with the de Ferran involved in an accident midway through and Castroneves retiring with mechanical problems later in the race. Invitations for this year's Indianapolis 500 were mailed March 1 and entries must be in by April 11. Other entries confirmed for the race include Arie Luyendyk, Felipe Giaffone, Scott Sharp, Mark Dismore, Greg Ray, Robbie Buhl, Airton Dare and Jaques Lazier.